Techni Measure supply a wide range of strain gauges from Japanese manufacturer TML to cover nearly all types of strain measurement applications, and we hold a very large range of gauge types in UK stock for fast delivery. The majority of strain gauges are supplied in packets of 10 gauges, with each pack including gauge factor and thermal calibration data applicable to the gauge manufacturing lot. The information below describes our range of strain gauge types, including typical applications and selection criteria. For further advice on the selection of gauges for your specific application please contact us. For information on the application and use of strain gauges, please see our Introduction to Strain Gauging article, or contact us for advice or information on our training services. We also offer a number of our most popular ranges of strain gauges and accessories through our online store. We also supply gauges in many other configurations, as well as gauges with specific creep characteristics and full bridge gauges for use in transducers. Please ask for further details. The choice of gauge grid pattern is dependent on the type of test to be performed and the strain data required. For simple tension or compression where the direction of strain is known, a single element gauge may be used. If the direction of principal strain is not known then a 3 element rosette can be used to determine the strain direction. Special patterns are also available for torque, stress concentration and residual stress measurement. For advice on the correct pattern for your measurement please contact us. 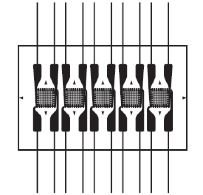 The “active grid length”, “gauge length” or “gauge size” all refer to the length of the gauge grid elements that generate a resistance change when the gauge is placed under strain. The total resistance change, and therefore the strain measurement, will be an average over the length of the grid. The grid length should be selected depending on the measurement type – e.g. short grid for very local strain measurement or long grid for averaged strain measurement over a larger area. Where relevant, discontinuities in the specimen material, e.g. composite material weave or concrete aggregate size, should be accounted for and the grid length selected to average the strain measurement over the required number of such discontinuities (usually a minimum of 2 or 3). The selection of grid width depends on the geometry and size of your specimen – narrow width grid patterns (LK) are available for axial strain measurements on slender specimens such as rods or pipes. The gauge “base” or “backing” is the area of material that will be bonded to your specimen. If you have limited space available on your specimen for gauge installation this may dictate backing size. The backing should never be cut or trimmed as there is a risk of damage to the grid which may affect the gauge factor. Special functions can be selected for some gauge types, defined in the table below. Please ask for details of which gauge types these functions are applicable. 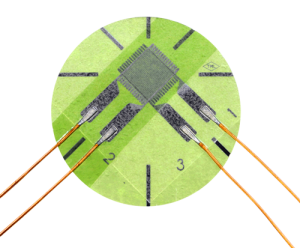 The majority of TML strain gauges are available in the ‘standard’ resistance of 120Ω. This standard resistance is not included in the part code for brevity. Other resistances are available, including 350Ω and 1000Ω. A higher gauge resistance reduces the current draw of the strain gauge, which reduces both the power consumption (important if battery powered / wireless signal conditioning is to be used) and the joule heating effect (important on specimens with a high thermal expansion coefficient, such as plastics). The majority of TML strain gauges are compensated to reduce the effect of apparent strain caused by thermal expansion of the test specimen. The compensation, in ppm/°C should be selected to match as close as possible the linear thermal expansion coefficient of the specimen material. TML gauge backings are colour coded to simplify identification of temperature compensation. Not all gauges are self-temperature compensated; where the number is missing from the part code this indicates that the gauge is not self-temperature compensated. 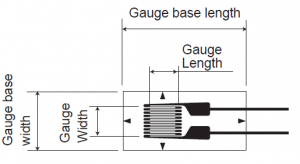 The majority of TML gauges are supplied as standard with short 2cm wires attached to the gauge, these are designed to be connected to extension leadwires via a solder terminal connector.